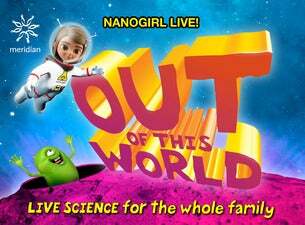 Meridian Energy and Nanogirl Labs are proud to present Nanogirl Live! "Out of this World!" - a Live Science Spectacular. Following our last two sellout tours, join Nanogirl, Boris (her trusty lab assistant), and CLAIR (Constantly Learning Artificial Intelligence Repository) for science and engineering as you have never seen them before. An action packed adventure with rockets, explosions, and even a real live tornado - bringing science and engineering to life in the coolest ways possible, right before your eyes. Wearing your limited edition VIP lanyard (yours to take home), take a closer look at the experiments from the show in a unique, behind the scenes Q&A session with Boris (Nanogirl’s Lab Assistant) as you peek behind the lab bench. You also get an extended meeting with Nanogirl after the performance – take amazing selfies and photographs to help you remember the show, and receive a personalised note from Nanogirl just for you. The Nanogirl Live! VIP experience is strictly limited to twenty guests at each performance – don’t miss out, book yours today! Nanogirl believes that science is for everyone, and the Nanogirl Labs team work hard to ensure that tickets to our Nanogirl Live! events are affordable. All tickets are priced at children’s prices (we don’t charge extra for adults), and we keep our prices as reasonable as possible. Despite those efforts, for some New Zealanders, theatre shows like this are still a very special event that do not fit within the family budget. Through our ‘Pay-It-Forward’ programme, you can help make science and engineering accessible for everyone. For every ‘Pay-It-Forward’ ticket you purchase, you enable someone who would not otherwise have had the chance to see this live science spectacular to come along. We work with organisations in each centre we visit on tour to distribute these tickets in the community. Our research with the University of Auckland has shown that our live theatre show can have a life-changing impact on young people, exciting and inspiring them in the critical fields of science and engineering. Your gift could change a life.